Want to upgrade your HTC Desire HD to Android 2.3.5 Gingerbread but don’t want HTC Sense included? Fortunately, you can. Thanks to XDA Developers member mike1986, you can easily update your phone to the latest Gingerbread but without the ghost of HTC Sense following behind. Through the Android Revolution HD 6.3.2 custom ROM, you can load Android 2.3.5 Gingerbread on your phone and avoid the memory-sapping burden of HTC Sense. As a bare minimum, several HTC Sense components can be removed, such as the Rosie launcher, HTC Themes, HTC Widgets, HTC Lockscreen, HTC Likes, and several others. A bunch of HTC apps are retained in the ROM, though. For instance, the HTC Dialer, which is arguably slicker and better than the stock Android phone dialer, is still there. Other retained HTC apps include Contacts, Facebook for HTC Sense, Live Wallpapers, and Navigation. All in all, you can expect your phone to feel a little better without the extra baggage. If you want to try a Sense-less Gingerbread experience, read on and find out how you can install Android Revolution HD 6.3.2 on your HTC Desire HD. Make a back up of all your important files, contacts, SMS, bookmarks, and Internet settings. Battery power must be at least 50%. Note: Use this guide at your own risk. We will not be held liable for any damage on your device as a result of following this guide. Here’s how to install Sense-less Android 2.3.5 Gingerbread on HTC Desire HD via the Android Revolution HD custom ROM. 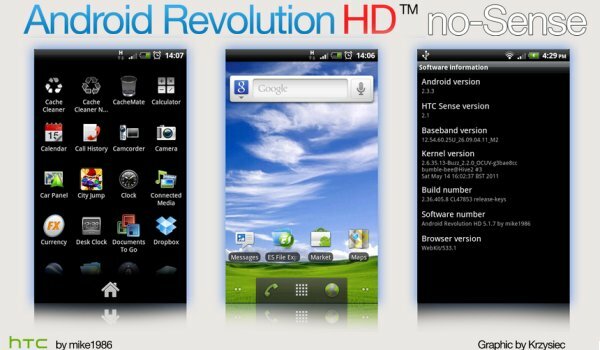 Download the Android Revolution HD 6.3.2 ROM to your computer. Do not extract the ZIP file. Download one of the no-Sense scripts to your computer. Do not extract the ZIP file. Copy both ZIP files to the SD card of your HTC Desire HD. Boot the phone into recovery mode by holding down the Volume down key and Power button simultaneously until the phone boots into recovery. Go to Backup and restore > Backup and create a Nandroid backup of your existing ROM. Return to the main recovery menu. Select “install zip from the SD card” and choose the Android Revolution HD ROM file. Confirm that you want to flash the ROM package. Do not reboot your phone at this point. Repeat the last step, but this time choose the no-Sense script package. Reboot your HTC Desire HD. Congratulations! You’ve successfully upgraded your HTC Desire HD to Android 2.3.5 Gingerbread but without the bloat of HTC Sense UI.